A macro shot of a rock waterfall at the San Francisco Botanical Gardens. 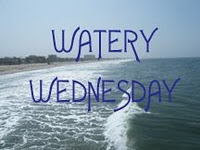 Be sure to check out the other entries at Watery Wednesday. Oh, the video is very nice and soothing...I wish I could let it run until I fall asleep! Very nice and how relaxing to sit and listen to the sound of the water. 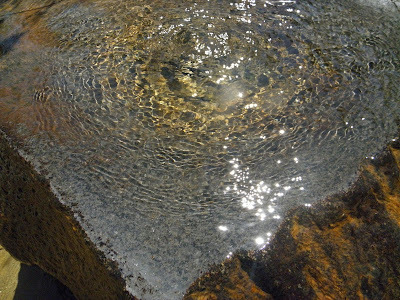 Beautiful reflections in the water in your video - some of the rocks look like golden nuggets. wow!it looks like blown glass. excellent photo. Such beauty and such peace. Hi Jo. This is a different WW, I might give it a go myself. Thanks for posting the video. I do find the sounds of water so relaxing. According to Chinese, water means money. It's such a pretty waterfall. I love the soothing sound of the water. It's looks so relaxing there. Carmen, I do too, what a peaceful way to fall asleep. Ann, Isn't it though, it just sort of washes all the troubles away. Jean, yes you should try it, it's fun. Catherine, it is so relaxing there, thank you. That was so cool! Here I am on my lunch break, and I get to see such a serene waterfall video! Thank you for sharing that! That little bubbler would bring serenit for sure. Wow, what a photo, Joanne, that's what I call a watery wednesday. I want to put my feet in that pond. I love the light in the first shot!!! Excellent photo and video. I love the sound of the water..so relaxing. Great water shot, and I love your header too! It's beautiful! This looks to be an idealic place to read a book or write. Very relaxing indeed. Such a calming sound the water makes. CM, thanks so much and I'm following you as well. Josep, I know, I do too and one of these days I might just do that. Misalyn, It is so relaxing there that I could fall asleep sometimes. great shot, the macro is very well done.